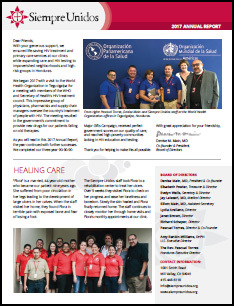 We are pleased to share our 2017 Annual Report detailing our accomplishments in providing HIV and primary care services to people in Honduras. As you will read, we completed our three-year 90-90-90 Major Gifts Campaign, received perfect government scores on our quality of care, and reached high-poverty communities lacking in HIV education and testing. We are immensely grateful for your friendship and support.